Higher Ground stiltwalking stiltwalkers and stilters are located in downtown Toronto, Ontario, Canada. 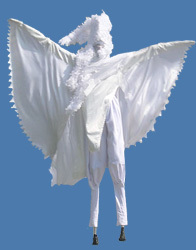 Higher Ground is a Toronto and GTA based stiltwalking company created by Artistic Director and performer Ben Block. With site animation and roaming entertainment, these giants come to life through extended movements and dynamics of height and space for a charged, absorbing atmosphere. Please note - you are seeing this site because you are larger than a mobile device, but do not have flash enabled. This site has a desktop and mobile version. We have 3s and 4 s of almost all our costumes. Some costumes are not featured and we are working on others. If you have specific needs we are very easy to work with. 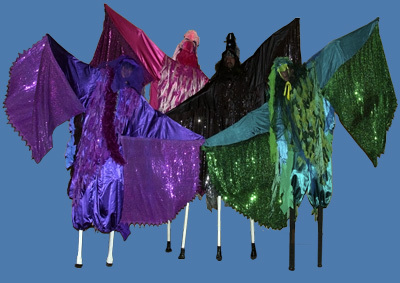 Higher Ground is a Toronto and GTA based stiltwalking company created by Artistic Director and performer Ben Block. We're four in the core, but we have another four satellites that we often hire when you need more. 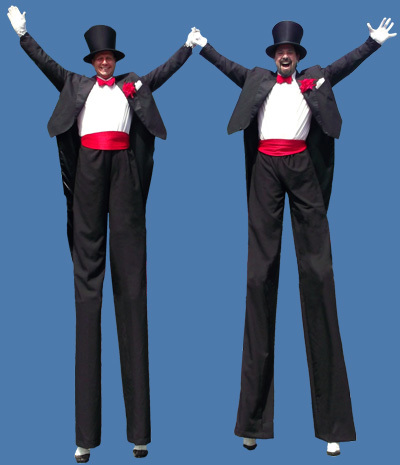 From site animation to fully choreographed dance pieces, Higher Ground's stilt giants come to life through extended movements and dynamics of height and space for a charged, absorbing atmosphere. 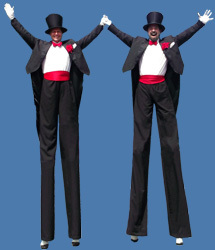 Founder and key performer Ben Block has been stilting for 20 years. 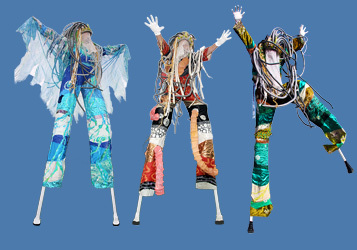 Ben Block's history of stiltwalking includes the 5 time National Moko-Jumbie Champion for Trinidad and Tobago, the off-site trainer for the Lord Of The Rings Stageshow and featured in the commercial, movie performances in Night Owl and The Secret Life, dance shows at FFIDA, EnWave Theatre, and Harbourfront, and Key Stilter for Cirque Du Soleil's Toronto based Luminato stage show. 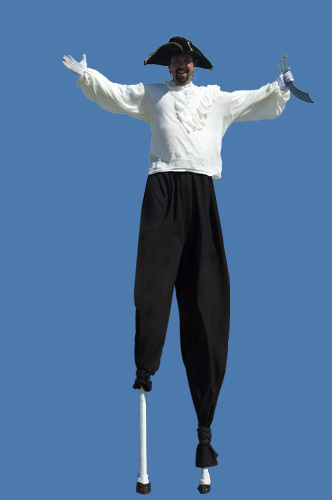 Jeremy Lascar has been employed as a Stiltwalker with Higher Ground for 8 years and is one of the hardest working and busiest stiltwalkers. He can work an audience and dance in the shows from a wide range of venues, busy nightclubs, parades, corporate functions, and overseas. It is our job to entertain and above all Jeremy puts on a show and ensures that everyone has a good time. Jodi Lascar has been working with Higher Ground for 10 years. 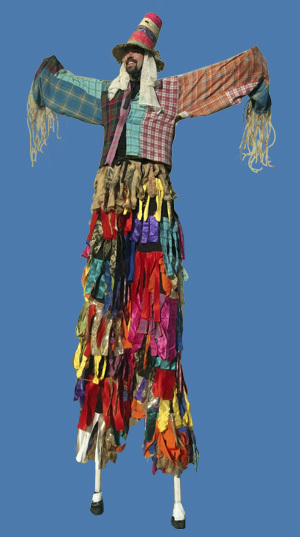 Jodi has performed in venues from Caribana to Gay Pride to the Brampton Flower Festival. 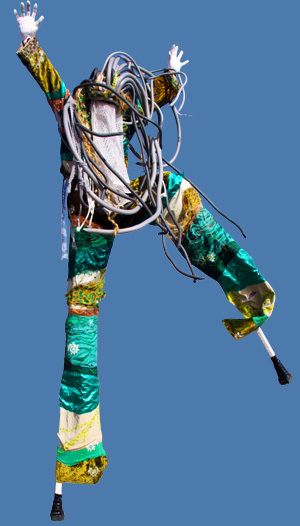 Featured stiltwalker in Dabble Magazine, Jodi was also the key stiltdancer for all the Breakfast Television spots. Jodi shows her real talent with adaptability at dancing choreography and shifting gears for entertaining the kids. Cory Sheehan is my next hired gun. 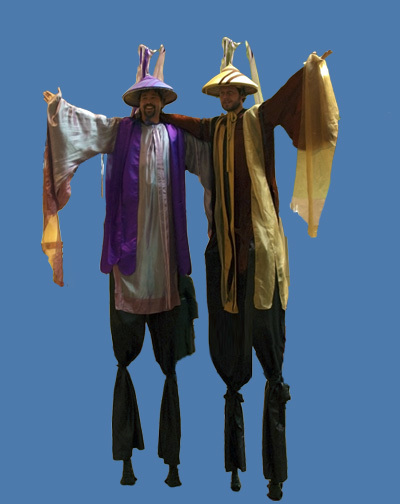 Cory has stilted with Higher Ground for 6 years, but comes from a stilting background. 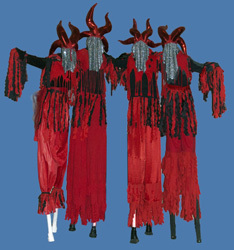 Cory has elegant movement, style and poise on stilts, and can work a costume to its fullest. Cory has a background in the performance arts and has acted and stilted on stage for shows like "summer please" "a comedy of errors" and the lead role in shakespeares "hamlet". Cory is versatile and can work the crowd as a key performer. 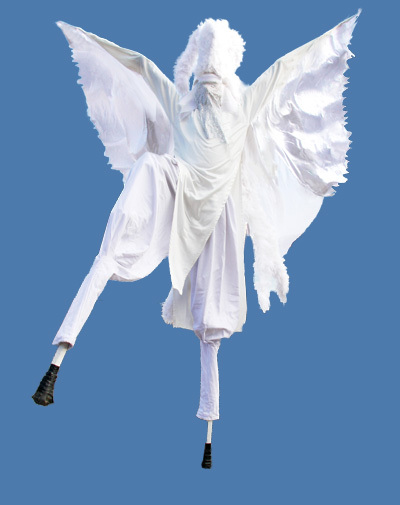 Higher Ground uses a multi-disciplinary approach, crossing the boundaries of many styles of dance and theatre to produce a wide range of stiltwalking performances.